When Designing or Specifying a Custom Coupling – Lean on the Manufacturer! If you are an original equipment manufacturer (OEM) or perhaps a maintenance engineer accustom to working on unique legacy equipment, it is generally only a matter of time before you will run across the need for a non-standard non-“off the shelf” type coupling. When this happens, it is important to reach out to a full line coupling manufacturer that you trust as early into the process as possible (which, often, may not be very early at all). The manufacturer will be able to discuss your unique circumstances, and perhaps be able to recommend either an alternative that you were not aware of and/or recommend the least cumbersome course of action. More often than not, a well-equipped and staffed manufacturer will be able to modify a standard product for you rather than “re-invent the wheel”. In many ways, coupling components can be viewed like Legos® in that they can be configured in a number of ways. Modifying and adjusting based of an established catalog product not only saves time & money, but also benefits from relying on proven pre-existing designs and design concepts. 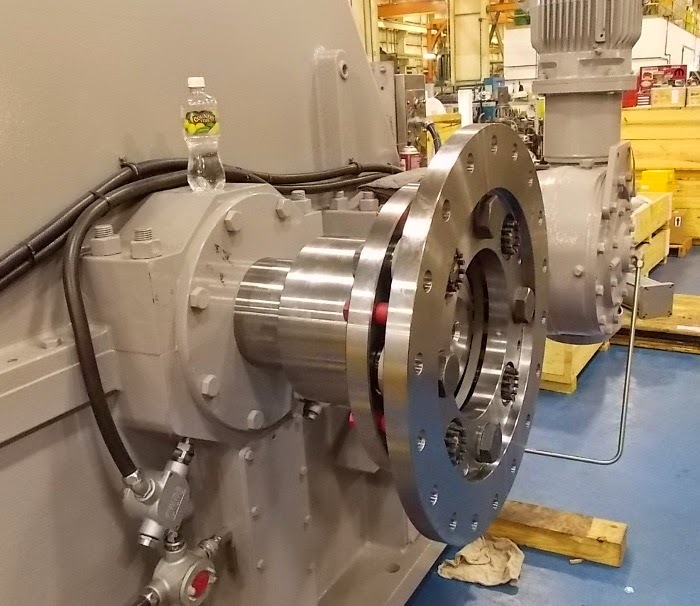 Pictured at the top of this article is a one half of a high speed, shear pin with bearing 8 bolt disc coupling developed by Lovejoy engineer Mark M. One of biggest design constraints on this project was a 12” between shaft ends (BSE), which was met with a unique design. Starting from an internal AutoCAD sketch, Mark and his team then used top-down design methodology and a suite of advanced Creo techniques which allowed the flexibility to iterate different configurations until this final design was reached. The solution shown is driven by keyless calculated interference taper bores and Lovejoy supported the customer’s engineering team calculations by providing the coupling half center of mass, rotational inertia, and torsional stiffness. No matter how complicated or complex (or simple) your application may be, a best in class coupling manufacturer will be able to walk with you, step for step, to ensure the coupling you require is satisfied in the most appropriate manner. Mark is a “proud father” of the coupling shown above, and, as part of Lovejoy’s premier “Engineered to Order Team”, takes great pride in being able to knowledgeably address many of the world’s most unique and intricate coupling demands.